You exist on many levels of consciousness at the same time. It can take a while to know this for yourself, and you will truly know through your experience. That experience can come through an intuitive flash, for example, but for most people it comes with continuous practice – and the most effective way of practicing [we] have found is through the meditation technique of Soul Transcendence – spiritual exercises. The following information is not something for you to memorise and learn only mentally but as background information that you can have in case you run across these things in your own “inner travels.” It can also give you an inkling of how large and expansive your consciousness is. You can know these realms through your direct experience, at which point the information moves out of the theoretical area and becomes experiential. These realms exist both within you (as your own levels of consciousness) and outside of you (as distinct realms of existence). They are not like stories in a building; rather, they are vibration rates, and each has characteristics, vibrations, and situations that are unique to it. The Soul comes from and has its home in the Soul realm. It takes on a physical body and comes here to gain experience, and Earth provides many, many experiences. As the Soul moves into a physical, material existence, it picks up an etheric body (sheath), which is a very fine substance that covers the Soul. As the Soul continues to descend, it picks up mental, causal, and astral bodies (sheaths), each one increasing in density. When “you” are born, it means that the Soul has picked up the densest sheath, the physical body. You are probably very acquainted with the characteristics of the physical realm. The most important things, from the Soul’s point of view, about being on the physical level are that (1) the Soul is gaining experience here, and (2) this level is a “springboard” into the Soul realm. It is only from the physical level that the Soul can move directly into the Soul realm and above. From any other lower realm – astral, causal, etc. – the Soul moves up level by level. Above the physical realm is another world, the astral realm, which relates to the imagination and which is invisible in terms of the material world. The word imagination comes from the words image in, and to imagine to take a thought or idea, put it in a form, and put it inside. Each of us, when we close our eyes, automatically goes into the astral level. Above the causal realm is the mental realm. Sometimes we refer to this as the mind area. (It is not the brain; the brain routes information, and the mind is outside the brain.) Another word to describe the mental realm is intellect. This is what we get out here in the world from books, teachers, and so on. We put it in, memorise it, and put it back out. The Soul, in contrast, is intelligence. It just knows. The realm above the mental is called the etheric realm, and it parallels the unconscious. This whole etheric realm is dark and there is little or no awareness of it. In fact, there is a void at the top of it, through which we have to pass in order to get into the Soul realm. This void relates to our unconscious. For each realm, there is a particular colour, sound, and quality. The colours are close to those listed on the Chart of the Realms, which also lists the sounds and qualities of each realm. The sounds given here are not exact but are an interpretation of sounds heard on the different realms, and the descriptive words are close enough to the actual sounds to listen for. When you are in the levels below Soul, primarily you are aware that you see the Light, and it is beautiful. When you reach the Soul realm, you are part of the Light. You are impressed with the Light which is actually the Sound Current, the audible Sound of God, which exists on all levels and can also be seen as various colours. 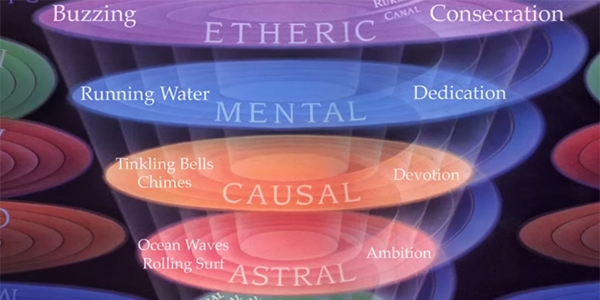 The Sound Current is the audible energy that flows from God through all realms. It is the spiritual energy on which a person returns to the heart of God. We follow the Sound of God’s voice and the Light of His countenance. That is called shabda yoga: listening to God’s voice, or the Sound Current. In this beautiful and powerful guided meditation John-Roger guides you through the realms of spirit as you travel in your Soul body. The key to breaking free is to love yourself and to love each experience that comes to you whether it appears to be negative or positive. Love it all equally.